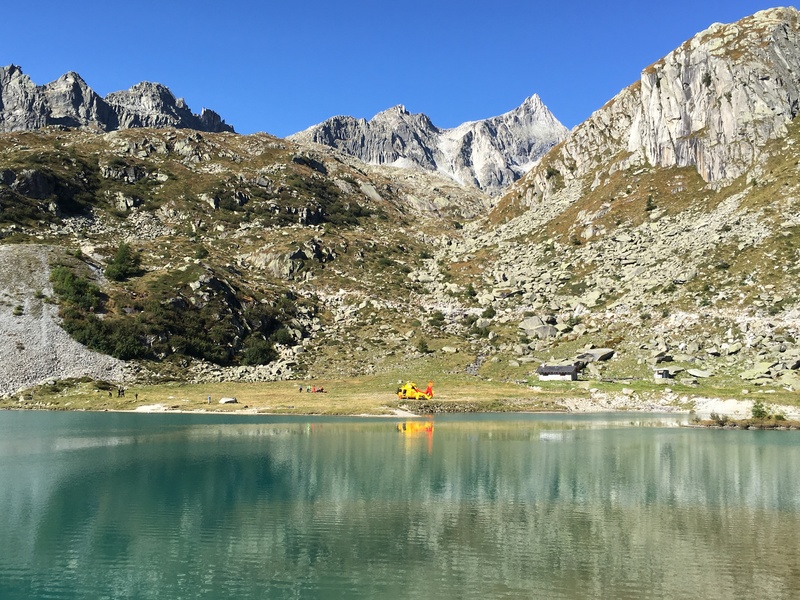 My 3rd session in this year’s world championship brought me to Lago Di Cornisello. 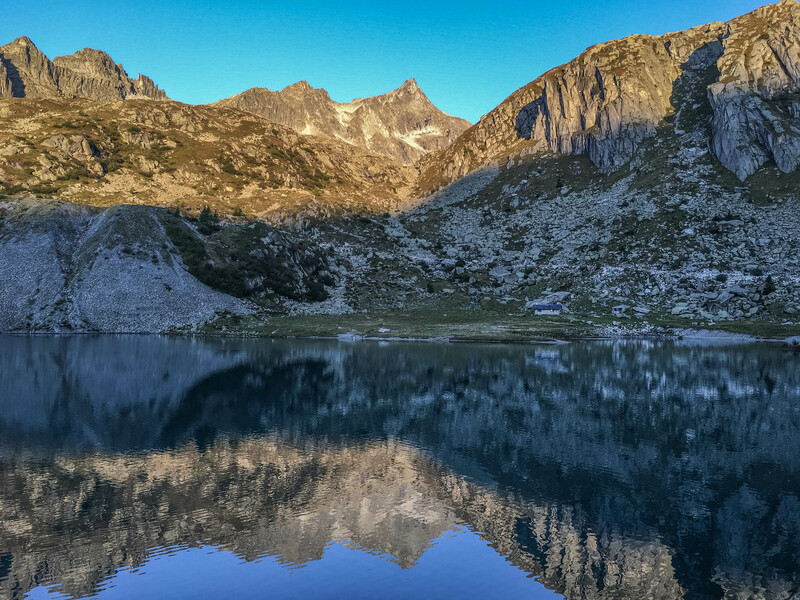 It was a high alpine lake above the tree line in the mountains near Pinzolo. Lago di Cornisello was bar none the most stunning location for a competition session which I have ever been to. The road was crazy to drive even small buses up but I can see why the organizers wanted to feature it in the tournament. I’ve done a lot of backpacking through the mountains of the western United States over the years. 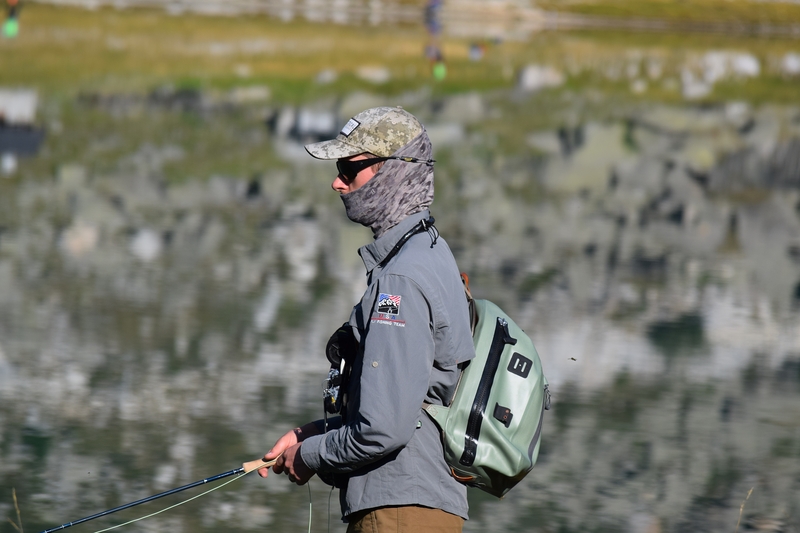 The setting made me feel like I was deep in the backcountry of Wyoming’s Wind River Range; at least until I remembered the Catholic shrine across the lake, the stocked brown trout we were fishing for, and the bells from the cows grazing in the hills around the lake. Then I knew I was still in Italy. 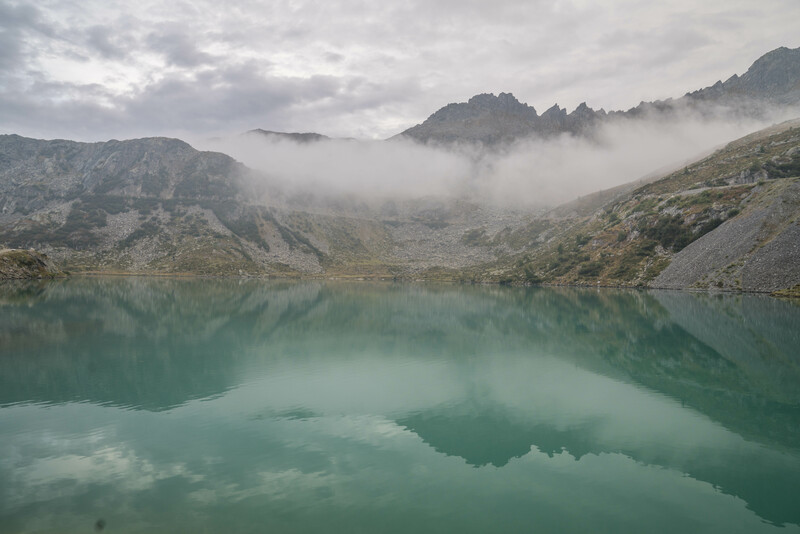 The lake was typical of a lot of high-altitude glacial lakes I have fished. At the outlet and the few small inlets, there were some extended shallows. The rest of the lake featured steep rocky sides with low scrub wherever a shred of top soil could be found as an anchor. The organizers did not allow wading which brought some challenges in certain beats where back casting room or access to deeper water as in short supply. My beat draw provided both of those challenges. The lake as seen during our scouting day during practice. Since the lake was a bank venue, the competitors drew a beat and then rotated once at the halfway point. I started on beat 16. It featured a steep bank and hill behind it with little room for typical back casts. When I scouted the beat there were rigs left in the trees and bushes from errant back casts. I knew that for anything more than short casts, I would have to get creative with my casts. During my preparation time, I scanned the beat with my captain Bret. There were three to four fish cruising just off the bank with several of them being large. I knew I had to get one or two of them early as the shallow cruisers had left the banks quickly after fishing began in the previous sessions. Thankfully Pat and Michael had been successful in the first two sessions on the lake and I had good information from them and from Bret and Cody who had been observing the first two sessions as well. I set up three rods with different rigs for the session: #1 a midge tip with an orange hot spotted black wet fly (Pat’s recommendation) on the dropper and brass beaded peacock diawl bach on the point, #2 an intermediate with a claret bodied white eyed booby (Michael’s recommendation) on the point and the same wet fly on the dropper, and #3 a dry with two nymph dropper rig. I kept the first two rods rigged with only two flies to help minimize tangling issues with the short back casting room on the first beat. As soon as the horn blew to begin the session, I made a short cast to the cruising fish I could see with the midge tip rig. I aimed trying to target the larger fish in the group. I retrieved in quick short strips to aggravate the fish as much as convince them to eat. The first two casts produced some strange and exciting follows from the group but no committed takes. It was clear these fish had been pestered by anglers the previous day. On my third cast a large fish broke from the group and made beautiful head to tail eat over my wet fly just under the surface. I didn’t feel any indication but knew the fish had taken the fly and stripped to strike. At this point the nerves came to the surface as I knew how important this fish would be. Thankfully I’ve dealt with similar nerves at World Championships before and focused on being as smooth as I could be with my fighting movements. After a short fight I put the 40 cm brown trout in the net and rejoiced a bit internally to be the first angler on the lake to have a fish in the net. The pressure of risking a blank was off and it was time to get to work. After this fish I stuck with the midge tip rig for another 10 minutes or so. However, the commotion had spooked the rest of the fish in the group and Bret and I only spotted one or two more in fleeting glances. It became clear the fish had spooked and scattered. I switched to the intermediate rig to cover a bit more water and focus on a slow fall to tempt wary fish in the flat calm conditions. The challenge was overcoming the lack of back casting room. To cope, I started using single hand spey casts to get some distance without trying to fire steeple casts over the crest of the hill 20’+ above and behind my head. It took a bit of practice to get it right because I had no room to form a D-loop since I was not allowed to wade into the water. I ended up having to form my D-loops diagonally to the side and then try to redirect the line where I wanted the cast to go. The casts weren’t always pretty but I was able to cover a lot more water than with other strategies. For about 15 minutes I didn’t have any interest from the fish. There were a few other anglers picking up fish around the lake and I started to get a bit anxious thinking I should switch techniques again. Just after having that thought I felt a small pluck during a retrieve but the fish did not lock up. I kept retrieving and made sure to do a complete hang of both flies at the end of the cast. As I slowly lifted and hung my point fly, I saw a flash and the white booby eyes I had been staring at disappeared. I set the hook, grabbed the net, and in a couple of seconds I had a 24 cm brown in the net. After that fish the takes dried up. With the remaining time I decided to split it between fishing a deeper line with the booby rig and fishing the dry dropper in static fashion. The sun was getting higher and the wind stayed dead calm, which usually means a deeper or static approach is a good strategy. Sadly, neither worked and I went into the rotation at the midpoint of the session with just the two fish on the board. However, from what Bret counted, only a couple other anglers had more than two fish at the break. We hoped the fishing would stay tough in the rest of the session given the beat I had drawn for the second rotation. I arrived at my second beat for the session and was pretty disappointed. With the way the organizers had laid out the beats, my entire beat was an underwater point that extended well out into the lake while beats on both sides had immediate drop offs at the shore. If we had been able to wade my beat could have been quite good. However, my only access to deeper water was about three feet of width between the flag on the left side of my beat and the drop off. Alternatively, I could reach the drop off beyond the point on the right half of my beat by bombing long 80’+ casts but only 20-30’ of each cast reached beyond the drop off and I had to worry about rigs hooking up on the drop off as I retrieved over them. Just before the second half of the session started, we got word from an official walking around the lake that a controller on the far side was having some health issues and they were delaying the session start. I figured the controller might have been suffering from some altitude sickness and that the issue wasn’t life threatening. I tried to stay loose by having a bit of a dance party with Bret and enjoying the privilege of being in such a beautiful place during a world championship. Then the helicopter arrived and we realized that the situation might be a little more serious. It turns out that the controller had been having a heart attack and the Slovenian competitor Matjaz Tirovic likely saved his life by administering CPR. Kudos to him! The life flight helicopter arriving to pick up the controller having heart trouble. After the helicopter left the organizers didn’t start the session for nearly an hour. When it started my plan was to start with the intermediate line and booby rig to begin, switch to a deep line after 20 minutes to sit the rig on the bottom beyond the drop off with a slow retrieve, and then switch to the dry dropper to camp the rig beyond the drop off. 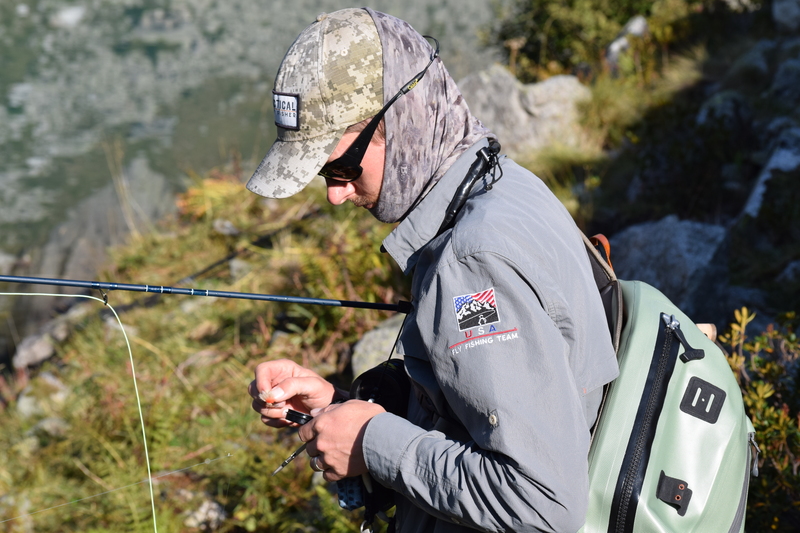 With all my rigs I spent time casting wherever I could reach deeper water. I went through the progression and had no interest by the time I reached the point of fishing the dry dropper rig. The first stint with the dry dropper rig produced nothing as well so I decided to change flies and move to the left edge of my beat. Just as I was about to tie on my point fly Bret and I saw a small fish cruise into the shallows at my beat marker. We watched it rise to take an ant. The Italian competitor to my left hadn’t seen the fish so we stayed calm to try and avoid alerting him or the fish. Thanks to my controller Alberto Zanghieri for the photos during the second half of my session. At this point I was kicking myself. That morning I left the reel in my hotel room which I planned to bring to have for a separate rod with a single dry specifically for cruising fish. With no dry fly rig available, I put on the chironomid I had planned for the point fly and made as delicate of a cast as I could manage just within my beat boundary and near to the fish. The fish did not see the fly on the first cast as it was facing the other direction. I waited until the fish turned to face my beat and repeated the cast. It quickly swam over and took the fly. I set the hook and nothing happened! I’m not sure if I timed the hook set poorly or if the hooking angle was just unlucky. The fish hung around for another cast but it was alerted after the missed hook set and swam off into the depths. The missed fish was my last shot during the session. A third fish would have jumped me several places in the standings. The missed fish and my absentee reel mistake provided another in a long line of hard lessons at world championships. In the end I was fortunate and two fish still landed me a 5th place finish for the session. My beat draw and rotation produced a 17th, 23rd, 29th, and 13th place during the rest of the championships. I felt simultaneously lucky at where I had finished yet disappointed that I wasn’t able to do more for the team. The flat bright conditions after several previous competition sessions had made the fish pressured and hard to catch for the whole field. The first session of the championship was won with 13 fish on the lake while our session was won with five fish by Jyrki Hiltunen of Finland. The information I had received from Pat, Michael, Cody, and Bret had made my decisions easier and I’m sure I would have struggled more without it. Bret and Cody’s diligence and observation on the lake continued to pay dividends for the team in later sessions. The lake ended up being our most dominant venue where we had the least placing points of all the teams. Our team total on the lake was 22 placing points while Italy had 31 and the Czech Republic had 37 points and Spain had 44. After the session was over, I had risen to 27th place individually and hoped to keep the momentum going in the last two sessions. Our team had mixed results and still lingered in 10th place. With two more sessions to go we stayed professional and continued our work and communication that night hoping the last two sessions would bring better success.